Do you know what the climate impacts of your everyday actions are? 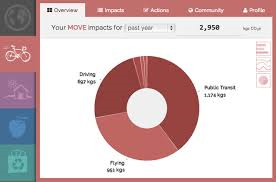 Aside from calculating the carbon footprint of each activity, and adding them together and keeping tabs on them all, which is not only time-consuming, but doesn’t take into consideration how your behaviors compare with others, there isn’t a really comprehensive method of tracking personal climate impacts over time. However, thanks to a partnership between Oroeco and Mint.com, there’s now a personal virtual climate dashboard that can put a carbon footprint on almost everything you do, from travel to diet to energy to housing and entertainment. The Oroeco web app, currently in beta, uses the spending information from your Mint account to assign a carbon value to your behavior, and can track it over time, compare it to other people in your social circle, and offer suggestions for reducing your carbon footprint. Oroeco also offers badges and real-life rewards (such as a Nest Thermostat) for making lifestyle changes that lower your carbon footprint, and users can opt to purchase personal carbon offsets through the app, which can be used to mitigate climate impacts. The service is free to use, and a forthcoming mobile app will make it easy to stay on top of your carbon footprint, right from your smartphone. Users will need a free Mint.com account (which can be very helpful on its own) to use the Oroeco service. Sign up to start tracking your carbon footprint here.